There is a warning that prey animals can get depressed and die when they lose their mates, family members, herd members, pack. You have to watch them very closely, keep up with weight checks, and give them more attention to encourage them to stay out and be active. 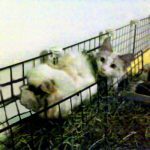 I have watched how my guinea pigs respond when someone dies, and it is usually that they don’t seem to respond at all. 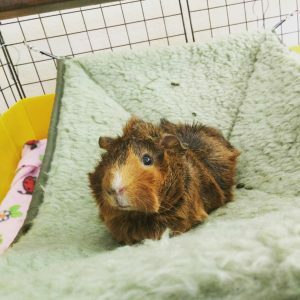 After Potsticker died last winter, I got in touch with a rescue about information on their Twilight Fosters and if they would be interested in me, should my final piggy need a buddy. It would be down to either Lily or Murphy, and turns out my last guinea pig is Murphy. My guinea pigs have always been in a central area of the home, and subject to a lot of foot traffic and conversations near their pen. Murphy was even born in my home, so she’s been around us giant predators since her first day with the ground under her feet. I was very nervous when her mother died in October, and it turned out that by the end of the month, Murphy needed medical attention. She was fine for a week and a half without her mother around, but after she had to have vet visits and her broken teeth attended to, she withdrew. She was frustrated and alone. She stopped talking to me for over almost two weeks, and was hiding often, and wasn’t responding to the treat call of the guinea pig: “WHEEK!”. I thought for sure that I had screwed up, and she was going to need another companion. But she started coming out to talk to me. She started responding to piggy calls. She started to ask That Guy about treats. She was out in the open all the time. She was gaining weight back as her teeth started to grow back in correctly. She’s even vocalizing now, and I hear her voice almost every day. She was always the quiet pig and let her mother and big sister do all the squawking. Murphy has been solo now for almost two months. I sat down on the sofa to do whatever humans do, and she stood up on the side of the pig pen and started gingerly wheeking at me. I got back up and gave her some fresh hay and stuck around for a minute or two to see if she required produce from the fridge as well. She’s doing pretty swell. A day or two ago, Dismal’s son asked if she’d had snacks and I told him “only a cookie”, so he came over to the pig pen and gave her a piece of fresh banana. I’m really proud of her. She’s got her fourth birthday coming in February.